Best friends Sadie (Brianna Hildebrand) and McKayla (Alexandra Shipp) want to build their social media presence so they can be the authority on local crime. In a bid to boost their social media worth, the friends lure and kidnap a crazed serial killer hoping to learn from him and ultimately frame him for the murders they carry out in their quest for fame. As more bodies pile up, Sadie and McKayla find their star very much on the rise but their newfound stardom could be the very thing that destroys their friendship and threatens to uncover their dark secret. 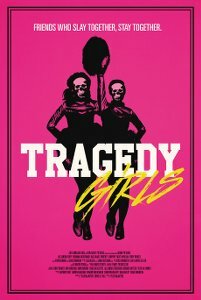 Tragedy Girls is from director Tyler MacIntyre and it takes its inspiration from the slasher genre as well as dark high school comedies such as Heathers and Jawbreaker. Paying clear homage to Wes Craven’s Scream, Tragedy Girls is a film that has its tongue placed very firmly in its cheek for the 90-minute duration. With sharp dialogue and plenty of references to pop culture, as well as horror movies of course, Tragedy Girls is a refreshing take on the horror genre through the very current lense of social media. There are plenty of laughs to be had during Tragedy Girls, and some real laugh out loud moments, but it doesn’t skimp on the horror aspect either. There are some incredibly inventive deaths and I heard several gasps followed by laughter at the FrightFest screening of the film. Sadie and McKayla’s behaviour escalates quickly and the film wastes no time in jumping to its dark side. The opening moments set the scene and the tone for the rest of the movie and I was hooked from there. Tragedy Girls even manages to weave in a believable romance story for Sadie who secretly has the hots for the sheriff’s son Jordan (Jack Quaid), who is unwittingly helping them build their social media. Keep your eyes peeled for Josh Hutcherson and Craig Robinson who play small parts but make very big impressions. At the heart of the film are Brianna Hildebrand and Alexandra Shipp. Both actresses commit to their parts with gusto bringing to mind a mix between Clueless and Heathers. Of the two Shipp brings the hilarity with her scarily good performance of the borderline psychotic McKayla. Hildebrand plays it a bit straighter but she delivers some killer lines (no pun intended) that showcase her ability for convincing with razor sharp dialogue. Also worthy of a mention is Kevin Durand as the serial killer the girls kidnap. He gives a mad-eyed and very entertaining performance that perfectly complements the vibrant tone of the film. Tragedy Girls is a welcome breath of fresh air for the horror genre. It’s suitably outrageous and shocking while maintaining a wicked sense of humour. MacIntyre has a real breakout hit on his hands here and Tragedy Girls could well be one of the defining horror movies of a generation. As the final moments of the film played out, I couldn’t help but root for these despicable girls and hope that they’ll be back for a sequel in the not too distant future.